The last one being my favourite. 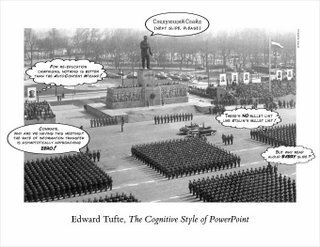 Today I tripped on his website, while following a link on the blogroll of another aficionado, and saw Tufte's essay on powerpoint for the first time. The picture of Stalin inspecting his army with added text baloons made me laugh out loud. Have a look yourselves. Filed in: Infoviz, Infographics, Visualization, Cognition, Usability.